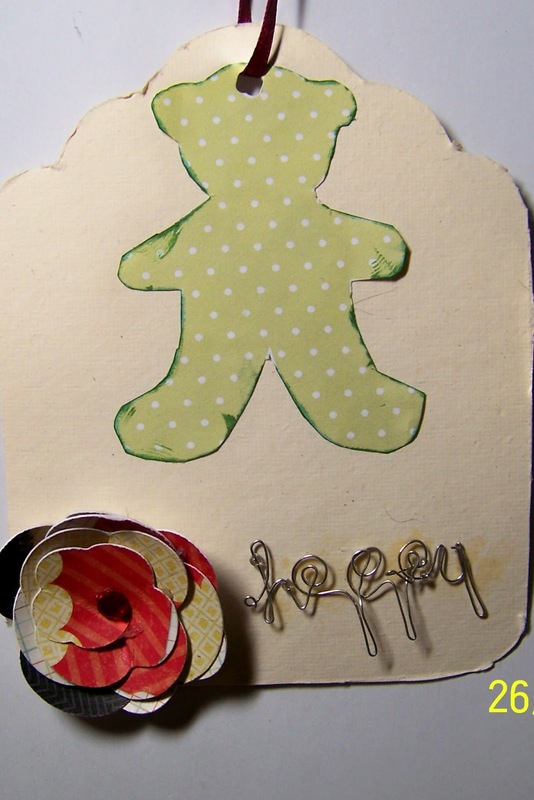 Just A Scrappin' Challenge Feb. 28, 2013 Teddy Bears with no brown and using quilling or rolled flowers on LO, Card or project. I downloaded these cute Teddy Bears for tags. 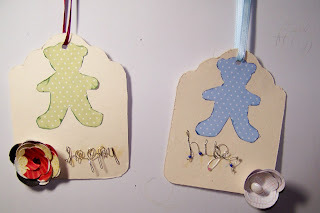 The tags can be used on a gift or used on a LO. 1. I used Art Philosophy to cut the <tag2> at 5 inches out of handmade paper from my stash. 2. I hand cut the bears from very light weight cardstock from stash. 3. Inked the edges of bears with Palette hybrid inkpads blue and green. 4. Glued the bears to each tag lining up the tag holes then punched. From stash found ribbons to string up tags for a package or scrapbook. 5. I cut the flowers using font <banner6> key at 2 1/2 inches. I used a Zot to hold center and curled the rest into the flower shape. This is regular cardstock from stash. 6. 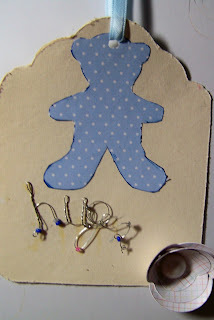 I used the wire words "happy" and "hugs" for my sentiment using glue to hold it onto the card. Usually I sew them down, but I want the other side of the tag plain to add a name to at the time I use it. 7. I added the flowers centers one gem the other pearl. Added to card using a Zot medium. So cute I could picture them on a baby shower gift. Tags! What a brilliant idea and so cute. TFS! Great idea for the tags! What cartridge did you use for the flowers? Art Philosophy page 68 using Font key! sorry I forgot to include this information. what sweet tags with the cute bears and pretty rolled roses!